These TimeBanks are in various stages of organization. Some have been established for several years, some are just getting started and some need new blood and energy to re-organize. 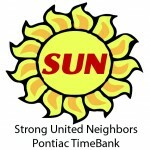 Unity in Our Community TimeBank, for the area in Southwest Detroit that encompasses parts of 48208, 48209 and 48210 zip codes. This TimeBank seeks to build the community while focusing on uniting elders and youth. TimeBank Grand Rapids is a system that helps people share services with one another.